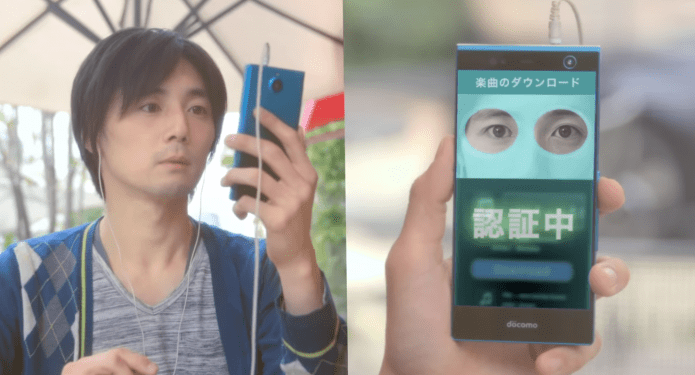 Japanese carrier, NTT DoCoMo in collaboration with Fujitsu will start selling the Arrows NX F-04G, one of the first phones with iris scanning biometrics, starting in late May. Users will be able to use the technology to unlock their phones with their eyes, log in to a number of Docomo services and make mobile payments. The duo claims that this is the world’s first smartphone with iris recognition technology that can be used to both authorize mobile wallet payments and unlock a device. The iris is a thin, circular structure in the eye, responsible for controlling the diameter and size of the pupil. The user of the phone must first save its iris pattern in the phone by staring at animated circles on the screen to use the new security feature. According to Fujitsu, it does this by merging an infrared camera and infrared LED to shine light on a user’s eye and seize their iris pattern. Beyond iris scanning, the Arrows NX F-04G comes with a 5.2-inch QHD screen display with 2560 × 1440 QHD resolution, 3GB of RAM, runs Android 5.0 Lollipop, 32GB of built-in storage and a 21 MP main camera. Fujistu first presented the prototype of the iris scanning phone that unlocks a phone at the Mobile World Congress in March. It consisted of thin lightweight hardware that was inserted onto a regular smartphone. The company asserted that the error rate of the prototype was about one in 100,000. The validation technology set by the FIDO (Fast IDentity Online) Alliance is supported by companies such as Microsoft, Google and PayPal. In January, Viewsonic had introduced a similar technology in a promotional video for its V55 smartphone. However, the phone is yet to be released to the public. Unlike fingerprint scanners that are found on the Samsung Galaxy S6 and Apple iPhone 6, the iris scanner allows users to unlock their phones without removing their gloves or worry about criminals making copies of their fingerprints.